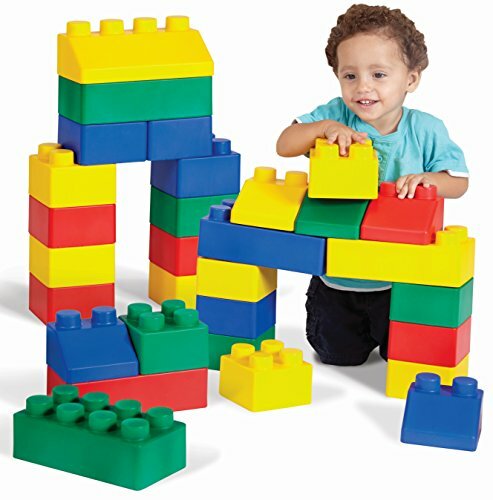 Snap together interlocking building blocks made flexible and safe. No hard plastic pieces to crack off or step on. Safe enough for a 6 month old; interesting enough for kids of all ages. 6 colors and assorted shapes; smallest piece starts with a hefty 4 1/2" x 4 1/2" x 3 1/2" and goes up from there. Durable, washable and non-toxic. Comes in an EZ clean up zippered tote. Developmental qualities include gross motor skills, socialization, building logic and reasoning and hand-eye coordination.